Because Becca Kingsley’s father is dying, she reluctantly takes a leave from her rural New Jersey veterinary practice to stay at her dad’s home on the Pennsylvania side of the Delaware River. Who’d have thought that crossing a body of water could insert her into the complex crimes that she barely escaped during her teen years? Or pull her heart into impossible contortions while trying to avoid being killed or witnessing any other murder? 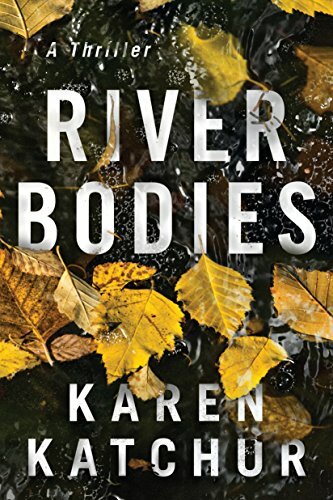 River Bodies is the third crime novel/thriller from eastern Pennsylvania author Karen Katchur. The earlier two delved into secrets between women and the terrible prices these can demand. With River Bodies Katchur launches a crime series instead, the Northamption County Series, with a promise to feature lead detective Parker Reed in the books ahead. But in River Bodies, Reed takes second place to the powerful narrative unfolding for Becca, who deserves to be angry over her father thrusting her into boarding school in her teens, breaking apart her family with this action and with his endless womanizing. Katchur uses Becca’s teen “self” as an “unreliable narrator” of events 20 years earlier. Not until she finally links her past to the violence endemic to her home town, with its brutal motorcycle gang, will she finally start to understand her father—who can no longer tell his own story. “The dread Becca had felt the night before when she’d crossed the bridge to home swarmed her chest. She remembered seeing something herself in the river yesterday. Her father reached toward the TV, pointing with his crooked finger. He started shaking. ‘Dad, what is it?’ . . .
“Becca looked down, away. She’d been hoping he was talking to the river about her, about how he thought he was falling in love with her. A stupid, teenaged-girl wish. ‘Does she [the river] ever answer you?’ she asked. As Becca tests this connection that still trembles with possibility, violence and the potential for more of it are erupting. And her dying father is at the center of it all, a family mystery she’ll need to uncover before she can find the heart of her own life after all. Deftly braiding suspense, crime, and the search for trust and truth, Katchur works a modern “deliverance” out of a harsh rural location, with potential that she more than justifies in her plot twists, pacing, and growth of character. Parallel to the crime fiction of Julia Keller (set in West Virginia) and the dark revelations of Karen Slaughter, Katchur’s writing also carries the high stakes of a Randall Silvis investigation. Don’t let the occasionally too-short chapters or the jumps of point of view or timeline bother you—it’s worth reading all the way through this intense thriller, and gives a taste of how extraordinary this author will be as she continues to reach into her best books ahead.